Have got some MKV videos either from online movie sites or your HD camcorders and want to burn them to DVD for convenient playback or long-term preservation? Looking for the easiest way to convert MKV to DVD so you can play them on your television or cinema screen? If so, just follow this step-by-step tutorial to burn MKV to DVD for playing on any standard home DVD player or TV. To burn MKV files to DVD, you can use Aimersoft DVD creator software. It allows you to convert and burn MKV videos to DVD with either NTSC or PAL standard. 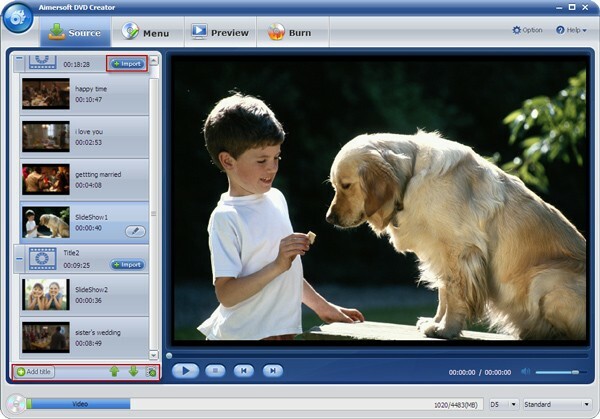 Besides, the built-in video editor and free DVD menu templates help to bring your DVD movie to the next level instantly. Apart from MKV, it can also create customized DVD from all other popular video formats like MOV, MP4, FLV, AVI, WMV, etc. For Mac users, Aimersoft offers DVD Creator for Mac to burn DVD from MKV video files on Mac OS X (Mountain Lion included). Before you begin to create DVD, you need to get the following things: A blank DVD disk (DVD +R, DVD-R, DVD+RW or DVD-RW), rewritable DVD-ROM, DVD Creator. Download the DVD burner and turn your MKV files into DVDs with ease. This step-by-step guide takes the Windows (Windows 8 compatible) DVD burner screenshots. The way to convert MKV movies to DVD Mac is the same. Just make sure you get the right version. Click the Import button to load these MKV videos you want to burn to the program. After the videos are loaded, you can preview them in the right Preview window and take snapshots of your favorite video scenes. The bottom green bar shows the size of the added videos and you need to make sure that the video size doesn't exceed your DVD disc capacity. Click the Edit button beside the video clip to edit video files. On the editing interface, you can crop the video frame size, trim large video into small ones, add watermark to video, adjust video effects, etc. according to your specific request. TipMoreover, this MKV to DVD burner offers an array of DVD menus. Double click the DVD menu to apply it. You can also make a personalized DVD menu as you like. Click Menu Template to customize your DVD frames, buttons, add text, background music and background image, etc. Here comes to the last step: click Burn and define the output DVD settings like TV standard, video quality, etc. When all settings are done, insert a blank DVD disc (DVD-5, DVD-9, DVD-R, DVD+R, DVD-RW, DVD+RW, DVD+R DL or DVD-R DL) into your computer's hard drive and click Start to burn the videos onto the DVD disc. If you don't want to convert the MKV movies to DVD immediately, you can save them as ISO files or DVD folders for burning later. Here is the video tutorial on burning MKV video files to DVD. MKV (Matroska Multimedia Container) is a multimedia container format that can hold various different videos, audio tracks, subtitles, pictures, etc. in one file and is widely used to store movies and TV shows. The file extensions of Matroska files are .mkv (video files with subtitles and audio tracks), .mka (audio files), .mks (subtitles) and .mk3d (stereoscopic video). This format now is considered as the alternative to AVI and MP4 and many popular online movie downloading sites provides MKV videos. 2. What programs can play MKV? The best way to play MKV files is to get a MKV video player. Popular MKV players include VLC, Media Player Classic, GOM Player and MPlayer. However, currently only a few mobile devices support the MKV format. To play MKV videos on portable media players, you can convert MKV to MP4, a format that is compatible with most portable devices. Nero for Mac: If you want to burn DVBD with Nero on Mac, you can follow this article to finish the task.